'Me time' is a concept most of us know about, and it usually conjures up images of relaxing in a tub full of bubbles with candles and a glass of wine, or maybe curling up on the sofa with a cup of tea and a good book, or perhaps doing nothing at all, and spending a day lounging around on the sofa, doing nothing productive. This 'me time' is so important, particularly when we live lives filled with school, university, work, parenting and so on. We're often so busy, and while we're engaged in one task our minds are jumping ahead to the next one. While it's good to plan ahead, this constant thinking about what we need to do next can leave us feeling like we have a never-ending to-do list, and we miss out on the satisfaction or accomplishment of finishing a task as we immediately start thinking about the next item on our list. Taking some time out for yourself, whether it's a couple of hours, a whole day, a couple of days, or even a week or more, and putting that list behind you for a while is so important. Not only does it allow your mind to rest, but it also allows your body to rest, which is vital for wellbeing. Without rest, you become tired and worn out, which can hinder your performance and in turn increase your anxiety about the tasks you're faced with on a daily basis. 'But I get enough sleep each night, surely that's rest enough?' you might be thinking. While getting a good night's sleep is also fundamental for good wellbeing, sometimes you need more than that. Sometimes you really do need to take some time out and do something for yourself, whether that's going out for a meal with a friend or loved one, spending a few hours reading in a coffee shop or people watching, having a games night, going for a spa day, or going on holiday for a few days or even a couple of weeks. This 'me time' can be as small and simple or as grand as you like – all it really is is time doing something (or nothing if you like a good lazy day) for you. The trouble is, living in a world where we feel like we ought to be constantly doing something, being productive, achieving something, it's easy to feel guilty for indulging in a day or two of nothingness and doing things simply for you. When you spend a day vegging out, watching film after film or spending hours online window shopping, throughout the day a sense of guilt and anxiety tends to edge its way onto the sofa and nestle next to you, telling you that there are other things you should be doing, depriving you of the joy and relaxation you should be getting from your alone time. We need to fight off these feelings and remind ourselves that 'time off' and 'me time' are called those things for a reason. Taking the time to do what we want and forget about our to-do list allows us to recover and restore, which sets us up to do better and feel better once that time is over. There is absolutely no shame in laying your responsibilities to rest for a while and watching that movie you wanted to watch weeks ago, or giving yourself a manicure, or finishing that book that's been sat on your bedside table for the past month, or making up for all the naps you've wanted to take recently and having a couple of early nights and lay-ins and the occasional afternoon nap. Although you might not have achieved anything as such or been anywhere close to productive, if you've enjoyed the time, it hasn't been time wasted. Instead, it's been incredibly productive time in which you've given your body and mind some much-needed rest and let yourself relax for once. I think it's important to take time out for yourself as often as you can; you owe it to yourself. 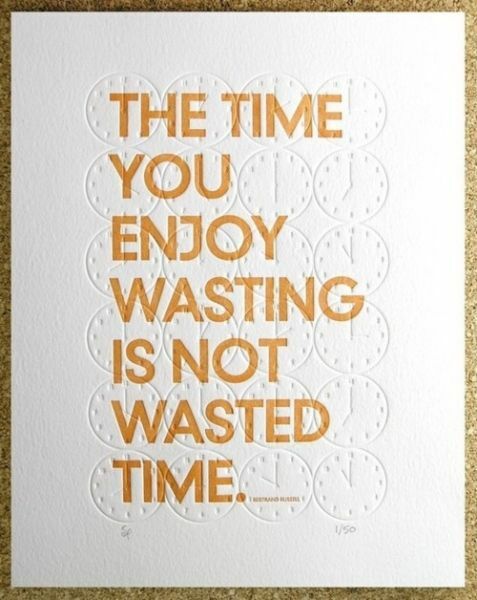 So, whether you have the time now, later, or even tomorrow, set aside half an hour of your day to do nothing. Boil the kettle, make some tea, and settle down for a while. Enjoy the calmness and stillness of the moment, and thank yourself for this time, this 'me time'.